I am very excited about participating in The Irish, The Jews, and Irish Literature panel and showing Shalom Ireland clips during the Irish Writers' Festival in Los Gatos, California! I am also thrilled to see The Representations of Jews in Irish Literature Exhibition for the first time during its San Francisco Bay Area stop on its world tour. Will the Luck of the Irish Shine on Israel on St. Patrick's Day? Last Thursday, Israel’s Labor Party elected a new leader. Isaac Herzog replaces Shelly Yacimovich as the party’s Chairman. 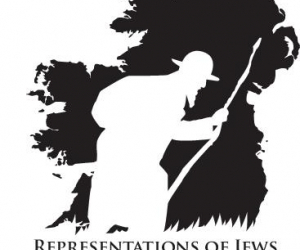 During our chat yesterday, Jennifer Willis asked how many Jews are living in Ireland today. As I mentioned, my numbers were a little dated. The 2002 Irish Census found that there were 1,790 Jewish people living in Ireland then. After our chat, I went to look up the 2011/12 census, I learned that there was no box for Jewish people to check off. Instead, they had to check "Other" and write in their religion.